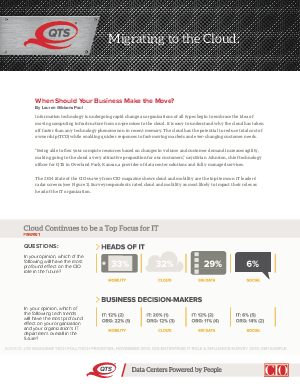 > QTS Data Centers > Migrating to the Cloud: When Should Your Business Make the Move? Information technology is undergoing rapid change as organizations of all types begin to embrace the idea of moving computing infrastructure from on-premises to the cloud. It is easy to understand why the cloud has taken off faster than any technology phenomenon in recent memory. The cloud has the potential to reduce total cost of ownership (TCO) while enabling quicker responses to fast-moving markets and ever-changing customer needs.